Photo by Alison Rosa ©2014 Fox Searchlight. All Rights Reserved. Birdman, Riggan Thomson’s alter ego, relentlessly haunts and taunts him. 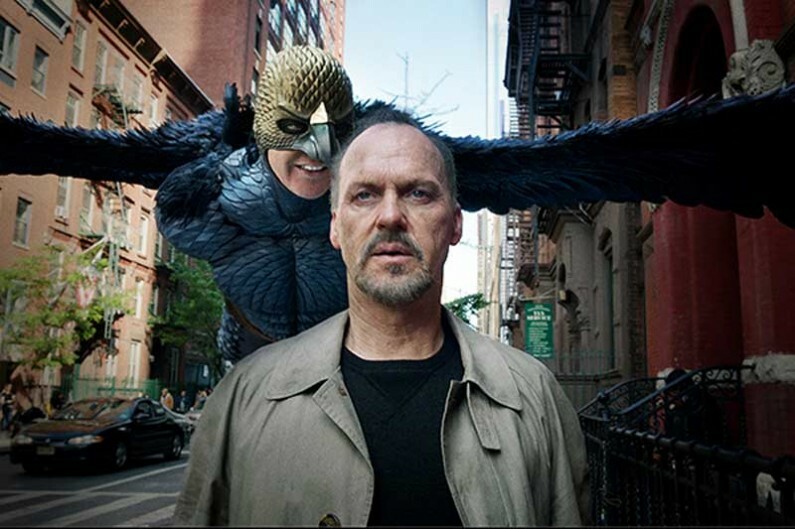 Michael Keaton plays both parts. 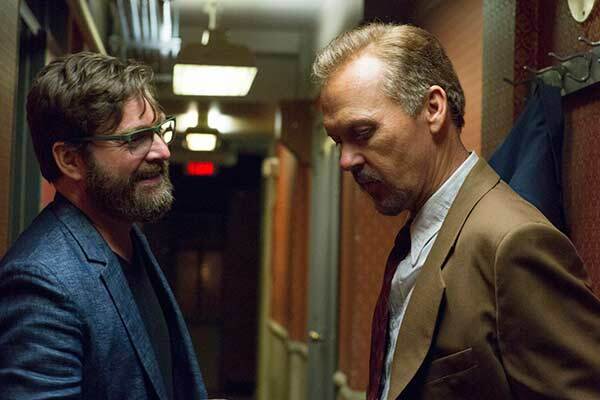 Photo ©2014 Fox Searchlight. All Rights Reserved. 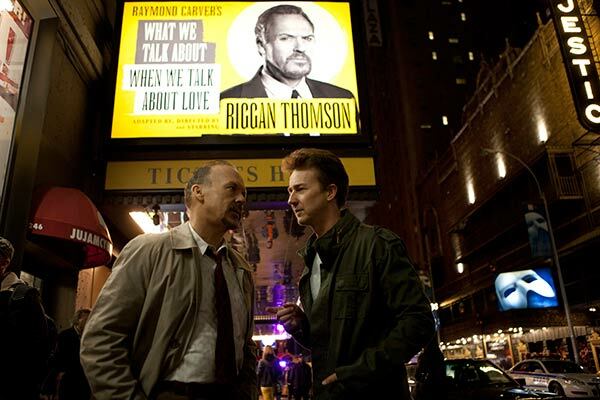 Riggan [Michael Keaton] deliberates with his best friend and producer Jake [Zach Galifianakis]…as the situation worsens, the wall and ceiling seem to close in on him…because they did! Michael Keaton, Emma Stone. Photo by Alison Rosa ©2014 Fox Searchlight. All Rights Reserved. 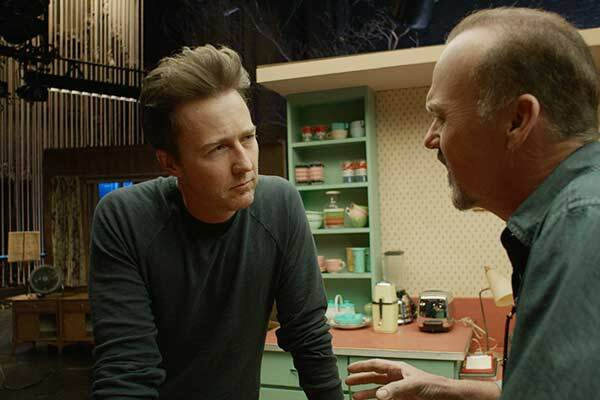 Micharl Keaton, Edward Norton. 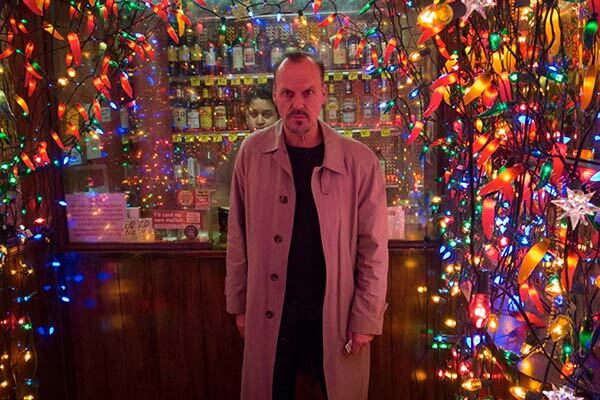 Photo by Alison Rosa ©2014 Fox Searchlight. All Rights Reserved. 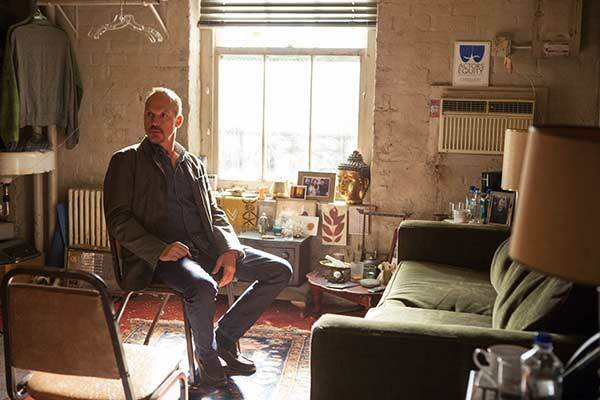 In Alejandro G. Iñárritu’s dark comedy BIRDMAN, Riggan Thomson [Michael Keaton] hopes that by spearheading an ambitious new Broadway play he will, among other things, revive his moribund career. In many ways, it is a deeply foolhardy move, but the former cinema superhero has high hopes that this creative gambit will legitimize him as an artist and prove to everyone...and himself…that he is not just a Hollywood has-been. Iñárritu notes that elements of Riggan’s story resonated with him, particularly the ephemeral nature of success and the question of relevance. The production shot much of the film in the real Broadway theater, the St. James on 44th Street in the heart of Times Square. The St. James has a storied history. Built on the site of the original Sardi’s Restaurant, it opened in 1927 and many notable productions have played there. “My first conversation with Alejandro was about the physical world of the theater on stage and behind it. He was very interested in the two emerging and overlapping. I thought it would be incredibly challenging to have these two worlds meet. 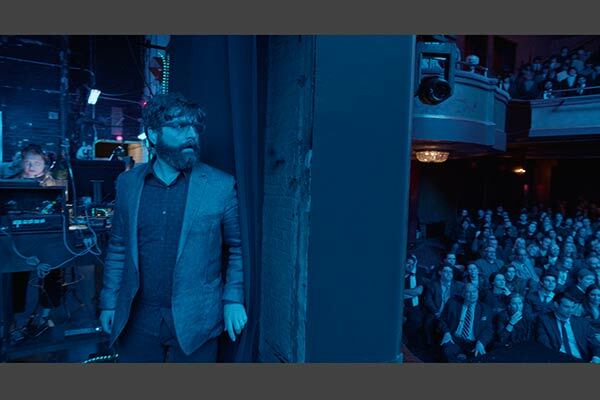 And the idea of filming in a real Broadway theater, designing sets for that and for the play plus the backstage dressing rooms and labyrinth of corridors was really intriguing,” Thompson reveals. Filming actually began with the entire backstage area built at Kaufman Astoria Studios. “The set was basically a large square with corridors and staircases leading up to different levels. All the dressing rooms, green room, wardrobe room, scenic area and hallways were created on stage,” DeTitta explains. “The corridors were well thought out with various carpet samples paired with wall colors. Since we were aware that the camera would be so confined, we knew that all those elements would be seen. The carpet we eventually settled on for outside Riggan's dressing room was chosen for the pattern: it had a bit of the feel of the setting from THE SHINING,” he says with a chuckle. “We particularly enjoyed bringing in the detail for the individual dressing rooms. It seems that sometimes in these dressing rooms the actors real lives do show through, which worked great as a base for set decoration. Of course the other thing we had to be concerned with were the duplicates we would need for the scene where Riggan goes on a bit of a rampage, destroying his dressing room. 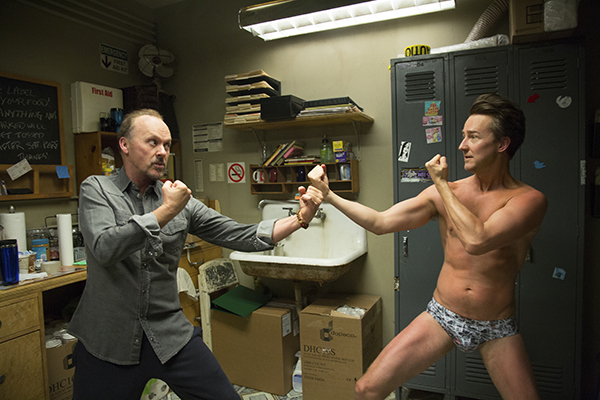 The Birdman poster was duplicated several times, and in various states. And, of course I love the line, ‘Hey don't mess with them, they're union!’"
The film was a combination of realities, some of which reflected both the simplicity and profundity of being human and the magic of the spirit, of love. DeTitta and Thompson just won the ADG Award for Contemporary Film! DeTitta’s response: "I love working with Kevin. He's creative, innovative, talented and a true gentleman. Special thanks to those who I could not have done it without…my assistants: Dan DeTitta, Judy Gurr [SDSA Associate member] and Karen Kates, my great crew: Jerry DeTitta and his fine group of set dressers, and my office staff: Gay Howard, Emmet Lundberg and Bob Beisher."